My Fascination Street: Organic Detox Tea-Perfect for a December Detox! Organic Detox Tea-Perfect for a December Detox! After stuffing my face like a madwoman this holiday season I totally need to get it together and remind myself of all progress I've made over the last 4 months. My saving grace is that I wasn't and won't be with my family on Thanksgiving and Christmas but it doesn't mean I wasn't out enjoying Thanksgiving dinner at the house of a friend. With that being said, I really want to spend the rest of the month trying to clean out my system and getting it ready for the madness that January brings when I feel the pressure to focus on my eating habits and working out. 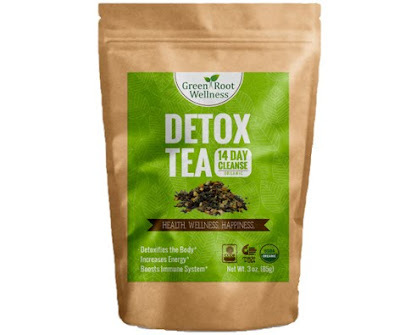 So Green Root Wellness Detox Tea is totally what I need right now. It has enough tea for 2 weeks and offers great benefits like eliminating the buildup of toxins and impurities, helping with digestion and of course because it has green tea in it it's a great antioxidant. It's a win in my book and I'll probably pick up another one of these once I'm done with it.